Peaches low-fat and low-calorie fruits packed with various nutrients and antioxidants. They are rich in vitamin A. B vitamins, vitamin C, and vitamin K.
Plus, they contain fiber that promotes healthy digestion and helps reduce cholesterol, too. In addition, being a good source of carotenes, flavonoids, lutein, and lycopene, the fruit fights conditions like Alzheimer’s disease, heart disease, macular degeneration, and cancer. Chlorogenic acid, present on the skin and flesh of the peach reduces inflammation and delays the development of degenerative diseases. Furthermore, peach is a good source of potassium, which in turn, is useful in reducing high blood pressure, controlling heart rate, and preventing gout. Besides, it has a mild laxative and diuretic properties. The pulp of this nutritious fruit is juicy and has a sweet, tart taste. Peach is considered as a great summer fruit. Nevertheless, it is available all the year round especially as in the form of canned and dried peaches. Regular consumption of this fruit helps maintain optimum health, improves immunity, and even facilitates weight loss. It is good for maintaining healthy eyes and beautiful skin. In addition, it does not increase the blood sugar levels. Thus, those suffering from diabetes can eat this fruit in moderation. In fact, peaches contain certain bioactive compounds with anti-inflammatory, anti-obesity, and anti-diabetic properties. Besides, the phenolic compounds present in the fruit reduce LDL levels or bad cholesterol. Plus, they contain iron and prevent anemia as iron is essential in the formation of red blood cells. Being rich in fluoride, it is good for preventing dental caries. Moreover, the fruit also cleanses the kidney and bladder. Thus, it regulates kidney function and treats kidney disease. Furthermore, drinking peach juice prevents nephritis and is considered as a good source of prenatal nutrition. As it cures fatigue and prevents pregnancy-induced anemia. Interestingly, it is believed that drinking peach leaf tea helps remove intestinal worms. While picking the fruit from the store, make sure you choose ripe peaches with a rich color (the red blush on the skin though, is not a sign of ripeness) but no greenish tinge, sweet aroma, and a well-defined crease. They should have a firm, fuzzy skin, and should not be overly soft. To check if a peach fruit is soft but not mushy, you can hold it in your hand rather than fingers, slightly press the top of the fruit, near the stem. In case you have mature but slightly unripe peaches, you can place them in a paper bag and keep it at room temperature. To facilitate the ripening process, you may also place ripe apples, bananas, plums, apricots, or prunes along with it, as these fruits release ethylene gas. This gas accelerates the process of ripening. When ripe, keep them at room temperature, away from the sun, and consume in a day or two. 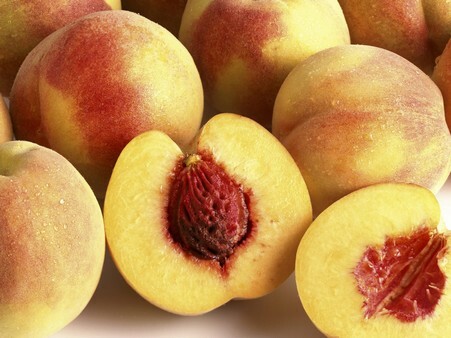 As for soft-ripe peaches, you can store them in the refrigerator up to 4-5 days. Needless to say, make sure you wash the fruit thoroughly before eating. If you have a huge amount of peaches and want to preserve them so that they can be used in baking afterwards, you may peel the fruits, slice them, and put them in the refrigerator for a few hours to freeze them. Finally, put these wedges in a plastic bag, seal it, store in the freezer. You can preserve the fruit in this way for about six months. Excessive intake of this fruit can lead to abdominal bloating, gas, and flatulence. In addition, it is suggested to avoid eating peach pits as they contain cyanogenic glycosides, which when processed in the digestive system, release cyanide. However, some people do eat small amounts of peach pits, like apricot seeds, as they contain amygdalin, which is believed to be beneficial for preventing and healing cancer.